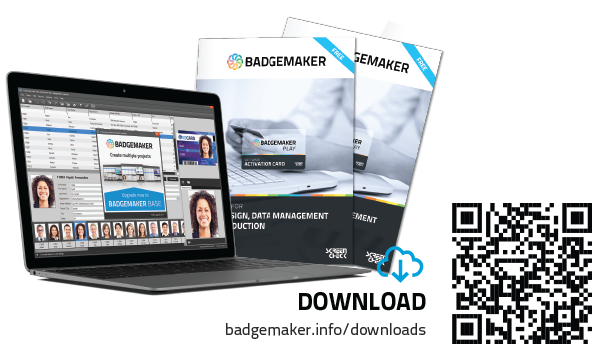 BadgeMaker 2.5 is all about improvements that make your experience even better. Improvement of the user experience for example, such as automatically opening your most recent project or being able to define specialty layers in your card designs. Because of the new BadgeMaker improvement program and the feedback we receive from our partners and customers, BadgeMaker is set to improve with every new update. – Added support of a wide range of card printers like the new Zebra ZC300 and ZC350 card printers and the new Magicard RioPro 360. Improved project list display and ordering. The preview panel now shows previews for the currently selected layer type. Zoom level is now applied by pressing enter. Elements can now be dragged between the front and back view. Improved barcode conversion for the design importers. Improved barcode rendering in design view. Improved 2D barcode rendering in design view. Improved card design list ordering. Dynamic fields are now highlighted in the element properties panel. Fixed an issue with pasting license keys. Fixed card preview rendering issues on Windows machines with display scaling enabled. Fixed maximize and restore window behavior not taking display scaling into account. Fixed incorrect UPC-E length validation. Fixed several card design project list ordering issues.